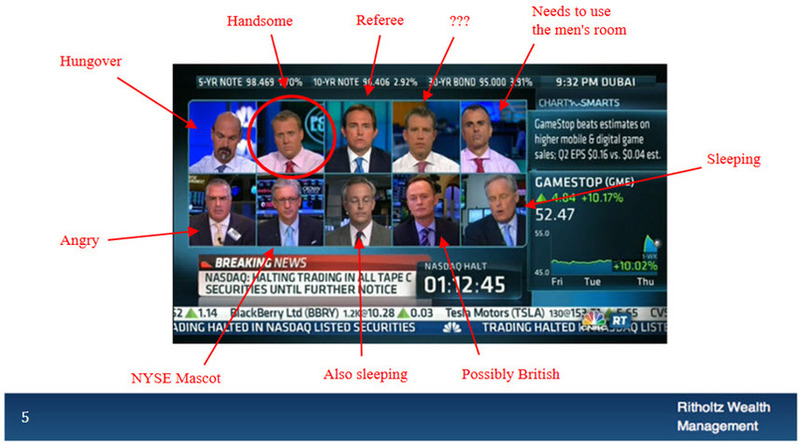 Those of you who catch some CNBC during the day probably recognize Josh Brown as one of the mainstays on the Halftime Report. From his books, Backstage Wall Street and the co-author stint via Clash of the Financial Pundits (with Jeff Macke) it’s clear that he and his colleagues see some of the same perspectives that we do. We’ve covered those complementary notions before here: Reformation: Center Stage. It was refreshing spending a few moments in Detroit this past Thursday and Friday. That may seem strange to some of you but the city is truly engaged in a renaissance. 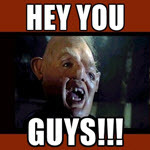 The image above (and link provided) is part of Detroit’s compelling invitation to locate a second HQ here. I’m told that Detroit will likely make the “short list” as this continues to develop. I assumed my seat at lunch on Friday next to a friend that I hadn’t met (yet). After brief introductions and observations about snow, I asked, “Did you know George Nicholson?” He smiled. “As a matter of fact, I spent last night with a couple of the Nicholson boys.” Wow. It turned out that his father had been influential in a few of Nicholson’s enterprises going back to the 1950s and 1960s and beyond. It’s a small world. It’s a Better World because of Nicholson’s contributions to the world of investing. The theme of a better investing world resonates in Josh Brown’s perspective, too. 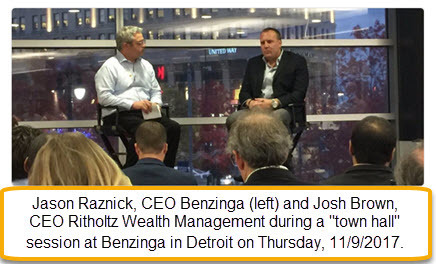 Jason Raznick of Benzinga.com had arranged a town hall meeting format with Josh on Thursday night. 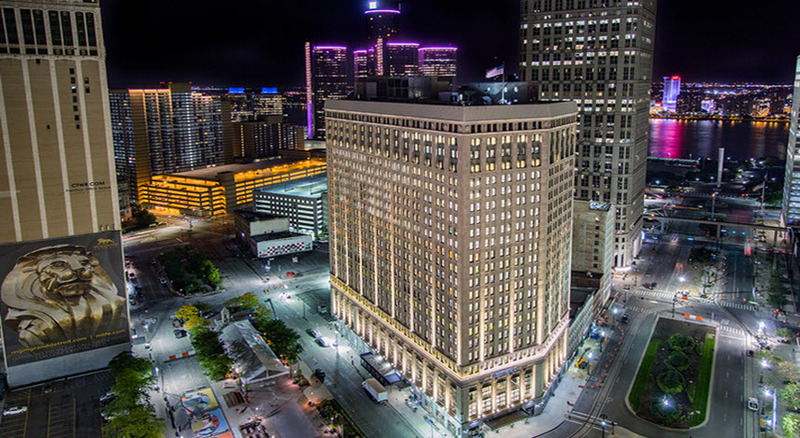 If you’re not familiar with Benzinga, Jason has created a Bloomberg-like entity for investors and traders in Detroit that has become quite formidable. Thursday night turned out to actually be a better opportunity to compare notes and spend time with Josh as he shared observations about a number of things. Caveat emptor. He shared that (1) He’d been dismissed (sent home) not once, but twice from summer camp as a child. (2) He knows the Wolf of Wall Street and spent some time in similar trenches. (3) He’s been part of a couple of crash-and-burn initiatives. That last one is actually a virtuous attribute. He’s been there and done that. He considers his evolution from stockbroker to registered investment advisor to be among the best decisions of his life. Incentives Matter. Incentives, good and bad. They both affect performance and behavior in the markets. Incentives matter. Often they dictate the probability of potential outcomes in very foreseeable ways. “The S&P 500 Index Funds Are Not 100% Passive.” Ben Carlson has referred to the S&P 500 as the World’s Largest Momentum Strategy The S&P 500 is constantly re-balancing and the cap-weighting emphasizes Apple, Microsoft, FaceBook, Amazon and Johnson & Johnson. S&P 500 (VFINX) routinely has a 4-5% turnover as companies come and go. That’s not passive. (Mark here) I’d take it a step further and remind investors a la Ralph Acampora from a Detroit stage in 2001 that lost decades happen. That’s right. He told the audience to pick stocks or different funds, because the S&P 500 was about to get “killed.” Ralph was right. And finally, we know that some of our sleep-at-night active investing would be deemed quite “passive” but on closer examination, they’re NOT. Anything but. We buy. We hold … for as long as it makes sense to do so. In the case of our Bare Naked Million Portfolio there have been less than ten sell transactions since Christmas 2005. The turnover is less than these large “passive” index funds. And by the way, that bare naked $1,000,000 is now worth $3,177,277 (11/10/2017) — a “passive” annualized total return of 11.2% vs. 7.3% for the “actively” managed WIlshire 5000 (VTSMX) over the same time frame. Thanks for the refreshing perspectives, Josh. The average Value Line low total return forecast for the companies in this week’s update batch is 1.2% vs. 2.9% for the Value Line 1700 ($VLE). 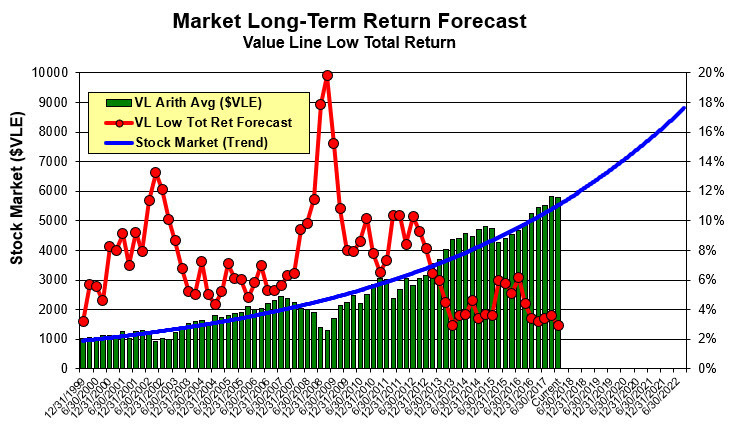 Value Line Low Total Return (VLLTR) Forecast. The long-term low total return forecast for the 1700 companies featured in the Value Line Investment Survey is 2.9%, decreasing from 3.3% last week. For context, this indicator has ranged from low single digits (when stocks are generally overvalued) to approximately 20% when stocks are in the teeth of bear markets like 2008-2009. The average return forecast (PAR) for this week’s update batch is 5.7%. Long & Short Term Perspectives. (November 17, 2017) Projected Annual Return (PAR): Long term return forecast based on fundamental analysis and five year time horizon. Quality Ranking: Percentile ranking of composite that includes financial strength, earnings stability and relative growth & profitability. VL Low Total Return (VLLTR): Low total return forecast based on 3-5 year price targets via Value Line Investment Survey. Morningstar P/FV: Ratio of current price to fundamentally-based fair value via www.morningstar.com S&P P/FV: Current price-to-fair value ratio via Standard & Poor’s. 1-Year ACE Outlook: Total return forecast based on analyst consensus estimates for 1-year target price combined with current yield. 1-Year S&P Outlook: 1-year total return forecast based on S&P 1-year price target. Small cap is not necessarily small (faster-growing) companies but in general, we like the idea of a nice blend. So yes, we’re interested in hunting down some actionable ideas among the most successful investors on our radar screen — seeking companies that aren’t on too many radar screens, yet. The discovery of smaller, promising and faster-growing companies has always been one of our favorite (and rewarding) activities. In that spirit, we’re expanding our efforts in this realm, seeking smaller, less discovered companies and add them to our coverage. We will continue to scour our Best Small Company Funds with leaders like Brown Small Company. Neogen (NEOG) and its subsidiaries develop, manufacture, and sell a variety of food and animal safety products. Its Food Safety division (47% of fiscal 2017 revenues) offers diagnostic test kits and related products that are sold to food manufacturers and processors to detect harmful substances in their products. Neogen’s Animal Safety segment (53%) manufactures a diverse line of products, including veterinary instruments, pharmaceuticals, vaccines, and disinfectants. 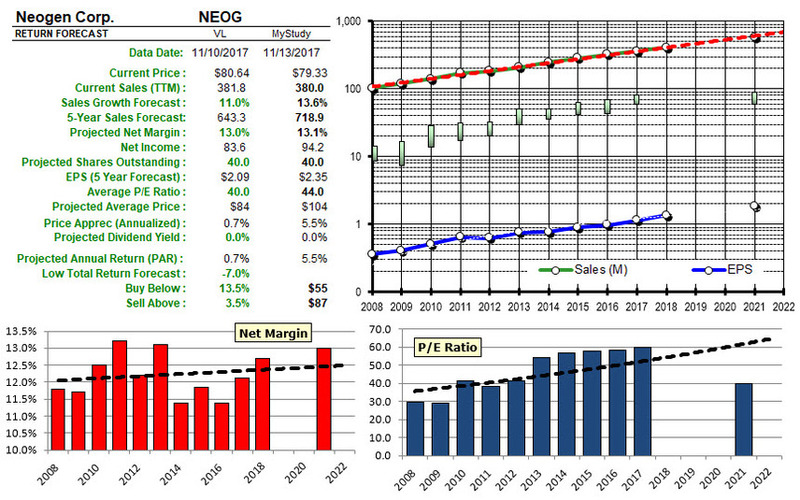 We are initiating coverage of Neogen this week in The Value Line Investment Survey. The Michigan-based corporation develops, manufactures, and markets a variety of products dedicated to food and animal safety. The company has more than 1,400 employees and a market capitalization that exceeds $3.0 billion. The equity has richly rewarded shareholders of late. Over the past year, the stock price has advanced about 55%. For comparison, the S&P 500 Index is up 23% over the same time frame. The out performance, in our view, can be attributed to recent quarterly financial results, which have consistently met or exceeded Wall Street’s expectations. The bull market, as well as Neogen’s good outlook has also helped.